The Schloss Lasserhof is a small palace at the Hellbrunner Allee. Whilst the Hellbrunner Allee was created in 1650, most of the bigger nearby courts pre-date this phase. The Lasserhof did as well - and was extended afterwards to become "Schloss" Lasserhof" (meaning "Palace" in German). The noble families that owned the Lasserhof initially were the Dückher until 1677 and the Counts von Martinitz afterwards. In the late 17th century, Prince Archbishop Johann Ernst von Thun founded the Rupertiorden, a knight order with the objective in fostering Salzburg′s military and offering rewards for military officials. The Prince Archbishop endowed the order with the Lasserhof. High-ranking officials of the Rupertiorden were obliged to live in celibate. The Rupertiorden existed until 1811. 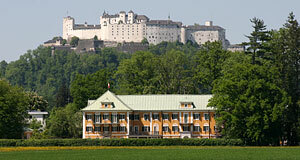 Only with the turbulent times of the Napoleonic Wars and the secularisation of Salzburg, the Rupertiorden was dissolved and the Lasserhof became private property. In the 19th century, the Lasserhof was modernised with a neo-Baroque façade. In 1931, a new wing was built in a Historicist style to blend in with the existing parts of the building. In 1952, the Lasserhof was turned into a Hotel called "Hotel Kaiserhof". In 1967, it was re-named into "Rupertihof" - which has been linked to two events. The obvious one is the role that the Lasserhof played for the Rupertiorden; but there was also a very shaping owner of the building precisely 100 years earlier, an entrepreneur called Rupert von Imhof after whom it was said to be re-named. In 2004, the Lasserhof was renovated once again; this time with a particularly outstanding effort that included the addition of yet another Historicist wing. By the end of this construction phase, the Lasserhof became the headquarter of Gössl, one of the most important manufacturers and design brands of Tracht or traditional Austrian clothing. Gössl has a shop and show rooms at the top-floors of the Lasserhof; the rest of the building, which is now called "Gwandhaus", is dedicated to a small exhibition on the development of Tracht and a gourmet restaurant. Since 2004, the Gwandhaus has developed into a popular meeting point in Salzburg, with concerts, art openings and other events being held here. These events include of course frequent Tracht fashion shows and design presentations. Note that some smaller side-buildings of the original Lasserhof are not directly associated with the Gwandhaus anymore. This includes most importantly the Meierei (the former administration of the original court) at the Hellbrunner Allee.